Tony–winning Peter and the Starcatcher upends the century-old story of how a miserable orphan comes to be The Boy Who Would Not Grow Up (a.k.a. Peter Pan). A wildly theatrical adaptation of Dave Barry and Ridley Pearson’s best–selling novels, the play was conceived for the stage by directors Roger Rees and Alex Timbers, and written by Rick Elice with music by Wayne Barker. 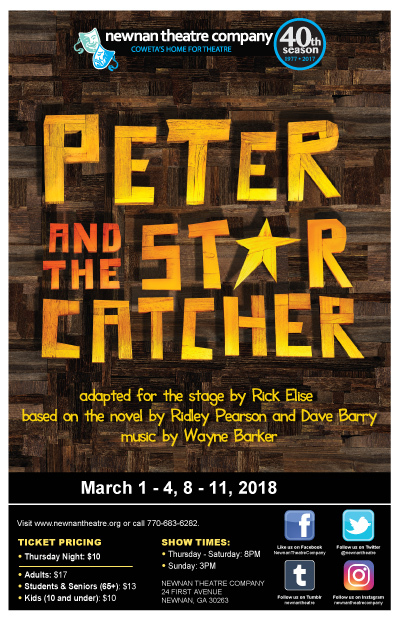 From marauding pirates and jungle tyrants to unwilling comrades and unlikely heroes, Peter and the Starcatcher playfully explores the depths of greed and despair... and the bonds of friendship, duty and love.